PERFECT location for your ski vacation! Our 3 bedroom / 3.5 bath condo, including a kids’ loft, is located in exclusive Upper Deer Valley and is approximately 300 yards from the Sterling lift. Walk 4 minutes along snow-plowed pathways right to the finest ski slopes in North America. We are quietly nestled right across the street from the Stein Eriksen Lodge and the Silver Lake Village area. The location is very convenient to skiing, shops, spas and restaurants, yet it is also quiet and secluded. Our totally renovated non-smoking vacation home is freshly decorated in a mountain casual style and we have redesigned everything for maximum comfort. The home is three levels with 2,500 square feet of living space. The total remodel included all floors, walls, cabinets, countertops, fixtures, and appliances throughout the home. The audio system consists of 4 zones for your musical enjoyment and we have installed 5 Samsung HDTVs. The upper level consists of the master suite with a king bed and a sitting area with fireplace. The master bath is well appointed with a very large steam shower and a granite double vanity. Also on the upper level is a generous sitting/loft area with a flat screen LCD TV and both Nintendo Wii and Xbox gaming consoles for the “kids” in your group. There is also a nice selection of books and DVDs for your enjoyment. The main level features an over-sized gourmet kitchen with professional grade cooking equipment and custom knotty alder cabinetry. The kitchen is completely open to the great room and dining room and provides a cozy setting for amazing gatherings with friends and family. Enjoy a stocked kitchen with all of the tools necessary to prepare a great meal after a long day of mountain fun. The dining room seats 8 with room for 3 more at the kitchen bar. The great room has a rich stone wood burning fireplace with a flat screen LCD TV and access to the outdoor deck complete with a barbeque grill. Also on the main level is bedroom 2, including a queen bed and built-in bunks. This bedroom has a full bath with granite vanity and a river rock shower. A powder bath is also available on this level off the dining room. The lower level is the location for bedroom 3 with a queen bed, full bath with a granite vanity, and built-in bunks. This bedroom also features a stone fireplace and an LCD flat panel TV. The top-of-the-line 7 person hot tub is located just outside and is protected from the elements by the overhead deck. This level also hosts our 2 car garage, mudroom area with boot warmers, and a full size front-load washer/dryer. We have incorporated many of our favorite features into our Deer Valley home. All beds are new for 2009 and are furnished with high thread count linens that will help to ensure a great night’s sleep. All bathrooms boast resort quality cotton towels and are stocked with all necessary amenities, including hair dryers. We hope you will enjoy our mountain home for an amazing vacation and the special memories to be created in Deer Valley. Sleeps 10 and all bedrooms have private baths. In addition to the main rooms, little ones will enjoy activities in the kids’ loft area with the latest gaming technology (Wii & Xbox) and a flat screen LCD TV. Our home is also furnished with a pack-and-play, a high chair, and grand supply of games, books puzzles, and DVDs. For those just learning to ski or wanting to improve their abilities, Deer Valley boasts one of the country’s top rated friendliest ski schools. We have found the Deer Valley Ski school to be an amazing experience for our children. As mentioned earlier, Silver Lake Village is a very short and flat walk (4 minutes maximum) along a snow plowed path. Be sure to check the distance to skiing as some of the complexes are a rather long hike to the lifts. The village area is very nice and is home to world class dining at Mariposa and family friendly dining at Royal Street Café. Venture across the street to the Stein Eriksen Lodge and enjoy dinner at the fine Glitretind Restaurant or enjoy their full-service spa. The town of Park City is a short bus ride or a 4 minute drive downhill. There you will find a wide assortment of shopping and dining opportunities. For consecutive years 2008-2012 Deer Valley Resort was rated the #1 ski resort in North America by readers of SKI Magazine. It is by far our favorite place to ski. The personal service of the Deer Valley personnel will astound you. The on-mountain food is superb, so don’t expect soggy burgers and stale fries for lunch. One major benefit of our location in Upper Deer Valley is there are no crowds at the rental shops or lift ticket windows in Silver Lake Village. You can literally get “first tracks” for 2 or 3 runs before the other skiers arrive up the lift from the lower Snowpark base area. This is because there is very limited public parking in Silver Lake. Another amenity that the resort provides is a free ski valet service so that you can store your skis,boots and poles right at the mountain overnight. Deer Valley also limits lift ticket sales during peak times and as a result the mountain is never overcrowded. As you will see, it’s all about customer service at Deer Valley. Please note that Deer Valley is a skier’s mountain and snowboarding is not allowed. For variety (and snowboarding), Park City Mountain is a 10 minute drive and The Canyons (location of the 2002 Olympic downhill) is a 15 minute drive; both of which are also world class ski destinations (just not #1 in North America for 4 years in a row). No smoking and no pets, please! Great property and great location! Wesley was a great host and checked in to make sure all was good! Would definitely rent again! Would definitely rent here again. Perfect location!! Beautiful home with great amenities!! Outstanding owner attentive to all needs and requests. 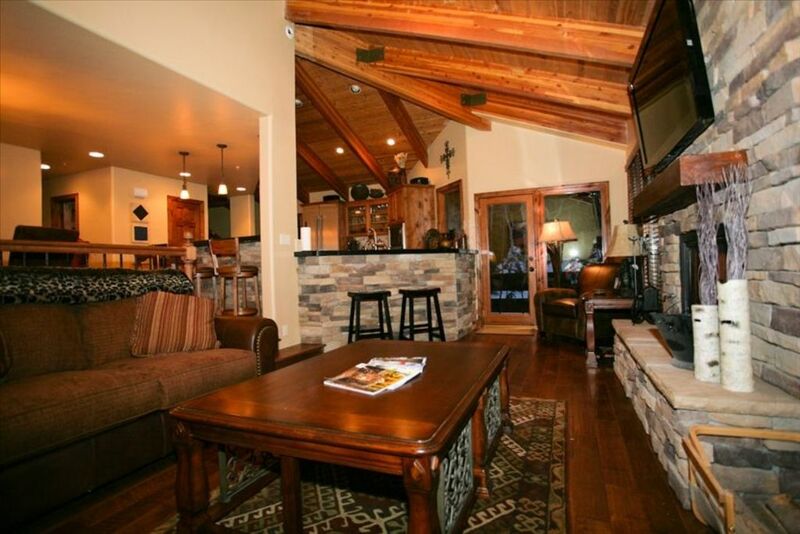 Spacious home featuring cozy fireplaces throughout...just perfect after a beautiful day skiing!! Love the location with easy access to ski lifts! We had a great week in Utah. Of course, we aren't responsible for the weather, but it snowed the entire week after quite a dry start to the winter. The condo is spacious, updated and well-appointed. It was perfect for relaxing in front of the prime-time Olympic coverage at night. The kids loved the hot tub. And of course, a washer/dryer is a necessity for a weeklong ski holiday. It is so nice to have a garage where skis can be stored overnight and a boot/dressing area downstairs. 5 Stars! I would totally recommend this condo for a vacation any time of the year. Wesley the owner was readily available for all of our questions. Have a great trip. What a fantastic time we had staying in this condo during our 2014 ski trip to Deer Valley. The furnishings were comfortable, the kitchen has a big refrigerator and a great oven and cooktop along with pots, pans and utensils. There is a nice view of the huge TV above the fireplace or into the dining room from the cooking area or from the kitchen sink. Seating for 8 at the dining room table was just right for sharing meals together during our stay. The walk to Silver Lake was very easy and the complimentary overnight ski and boot storage kept us from having to carry skis, poles and boots back to the condo every night. No ski trip is complete without a hot tub and the one for this unit had great jets to help soothe our body aches every day. It was very comfortable for 4 individuals. The owner was easy to work with and I'd highly recommend staying here on a future ski trip. Location, Location, Location! Updated Townhome with all the amenities. Location, location, location!!! We just completed a 6 night Spring Break trip for two families consisting of 4 adults and 5 children. We use VRBO for most trips and couldn’t have been more pleased with this recently updated townhome. This was our first time to stay mid mountain and we realized this allows for maximum ski time. Silver Lake lifts are only a 4 minute walk. Also, Stein Eriksen, Utah’s only Forbes Five Star, AAA Five-Diamond hotel is across the street. We did not rent a car and it worked out great. $15 taxi ride in you desire to visit Park City or bus for free. It was a treat to have heated floors on the lower level when entering after a day of skiing. The bonus was the boot/glove warmers. Also, the hot tub was largest model I have ever been in. It has room for 7 and was definitely a high-end model. There is an area behind the hot tub where the children played in the snow. After a hard day of skiing, we would end up at the home, build a roaring fire, turn on the surround sound system and open up a bottle of red wine. The den has a deep leather L shaped sectional. Above the “wood” fireplace is an extra large flat screen. The kitchen and all appliances were recently updated. The gas burner stove has an attachable grill plate that was very convenient when cooking a large breakfast before hitting the slopes. Restaurants in DV and Park City are great. Normally, we go out to dinner, but the home was so comfortable, we decided to cook and not waste time in restaurants. We enjoyed the open floor plan looking into the den. Plenty of room with the bar stools and large kitchen table. There is also a charcoal Weber grill on the large deck. The faucet has an “instant” hot water lever making it easy for hot chocolate or tea. The upstairs Master Suite has a fireplace and king size bed. The bathroom has a large steam shower. Outside the Master is an entertainment area with TV and games. A ladder takes you to a loft where 2 of the children hung out and even slept a couple of nights. The other 2 bedrooms were spacious. Beds were really comfortable. The owners were very friendly and easy to work with. We have rented multiple times in DV. Without a doubt, we were thrilled when arriving and only have good things to say about the townhome. We look forward to our next trip.